Horse was probably the most popular apple grown for home use in the South. Believed by some to have originated in Nash County, North Carolina in the 1800’s, Horse was immensely popular for its many home uses including fresh eating, cooking, drying and cider and vinegar making. The tree is a late bloomer, a prolific producer and an early bearer. 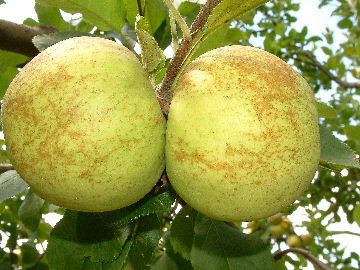 Fruit is medium to large, slightly ribbed with thick golden yellow skin. Flesh is firm, yellow, juicy and quite tart until fully ripe. Ripens July to August.